If you are desired to be a plant listener,use our soil test kit to hear out their needs! - Moisture Range: 1-10 (1-3DRY, 4-7NOR, 8-10WET). - Relative Light: 0-2000 Lux (0-200 LOW, 200-500LOW+, 500-1000 NOR 1000-2000 HGH). - PH Range: 3.5-8 pH (3.5-6.5 ACID, 7 NOR, 7-8 ALKALI). - Probe length: 8 inch. - Distance between probes: 0.5 inch. - Copper probe diameter: 5 mm. - Aluminum probe diameter: 5 mm. - Package weight: 3.5 oz. 2.Insert the probe slowly and vertically into the soil about 4-6 inches. 3.Adjust the position of the probe until the pointer on the dial swing slightly. 4.After 10 minutes, Note moisture/pH/light level in the dial. - Do not insert the soil test kit into very tough soil or touch hard objects, easy to damage the probe. -Do not use it to test pure water directly or other liquids, electrolytic response index will be affected, it can only be used to measure the soil. -The digital soil tester cannot accurately gauge the intensity of grow lights because most light bulbs lack the full spectral range of sunlight. 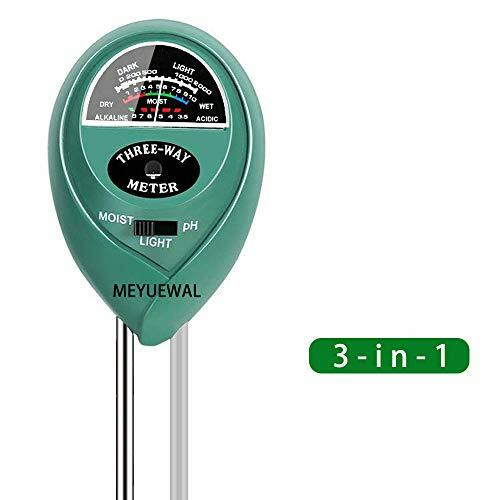 -To maximize the accuracy of sunlight readings, point the light sensor at the top front of the meter toward the sun. -Wipe the probe clean with a soft, damp cloth and dry it before and after each measurement. -Do not leave the probe inserted in soil longer than necessary to make a measurement. -The indicator will not move if the soil is too dry, before you test it, it's better to water the plant first. -The reading depends on the soil type. After soaking soil that has redwood compost in it, it did not read any moisture, but other soils do read moisture. -Don't use the probe near the magnetic material and away from other metal objects. ★EASY TO USE: just need plug and read. It's very simple to use! If the plants are very dry, the Soil test's Pointer will do not rotate! It means that your plants need to water immediately. ★NO BATTERIES: It works without batteries, just insert into soil ≥t accurate, clear readings in only 10minutes. ★COMPACT FOR INDOOR & OUTDOOR USE: Know when to water, adjust pH, or change lighting for your garden, flowers, plants both indoor and outdoor. ★SCIENTIFICALLY ACCURATE: Easy & accurately to read moisture, pH and light levels, promotes healthy plants.